Nobody can deny the merits of living in a digital age. 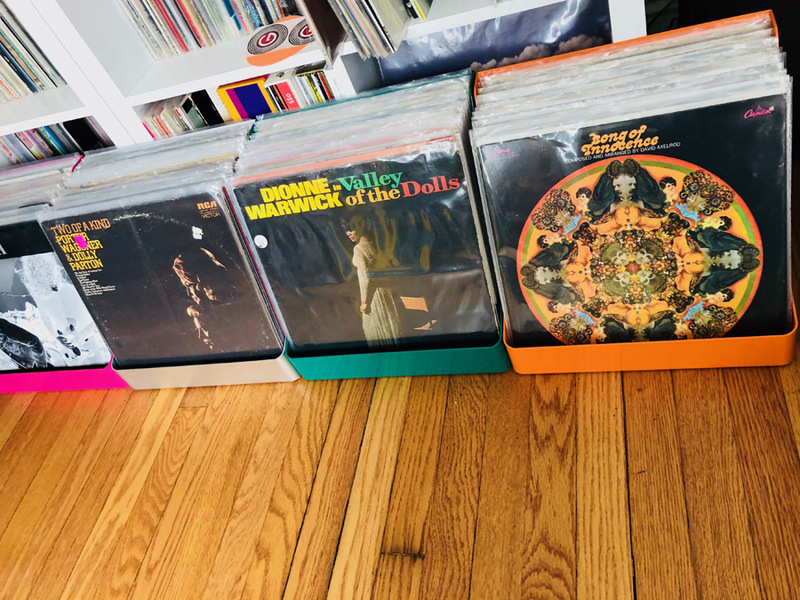 But many music lovers believe a majority are missing out on the tactile relationship that was once part of the listening experience – handling the record cover, reading the lyrics on the sleeve and enjoying the album artwork as the LP rotated on the turntable. Streaming digital music allows anyone to listen to just about any song at any time, but for some, that type of listening experience doesn’t hold a candle to the full fidelity experience of hearing a tune via vinyl on a decent turntable with a good needle. Vinyl has come back in a big way and is selling more now than it has in the past 25 years. The problem for collectors is how to reasonably store and display them. For Ben Robertson and Chris Baronner, founders of Chicago-based Flipbin, music has been a big part of their lives. About three years ago, Robertson was looking at the records strewn around his record player. Frustrated with the situation, he drew up a crude sketch of what he thought would be a good storage and display solution that would allow him to easily flip through his favorite records. A designer friend took that drawing, mocked it up on CAD and the idea for the company got legs. Baronner, a friend of Robertson’s was looking for his next career after leaving the music industry where he worked for a couple of different labels. He thought Robertson had a great idea and came on board. They launched a Kickstarter, thinking at first they would make their product out of wood before talking to representatives at Classic Sheet Metal Inc. about going with metal. A range of colors are available for Flipbin storage units – all made possible by S&B Finishing located in Chicago. Flipbin’s storage units are made out of aluminum and come in two sizes: one that holds 7-in. records and one for standard 12-in. records, the latter of which will hold approximately 33 records. The product has a “kickstand” behind it so it doesn’t have to be leaned up against a wall for support. To produce his Flipbins, Robertson had to seek out a fabricator with the necessary chops. And he found that fabricator in Classic Sheet Metal, located just outside of Chicago. The company specializes in a full range of processes: metal stamping, metal forming, welding services, punching and laser metal cutting. 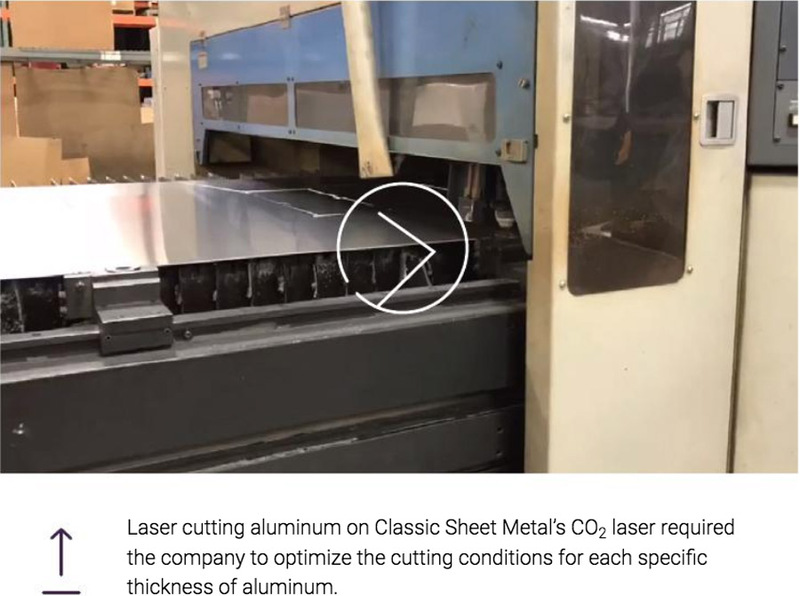 To cut the aluminum for the Flipbin product, Classic Sheet Metal uses its 4-kW CO2 Mazak Super Turbo X510-MK2 laser with an automatic pallet changer. The company also utilizes a 1.2-kW LVD combo laser/punch and 2.5-kW Mazak laser for other projects. The aluminum used for the Flipbin models is 0.80 in. thick. 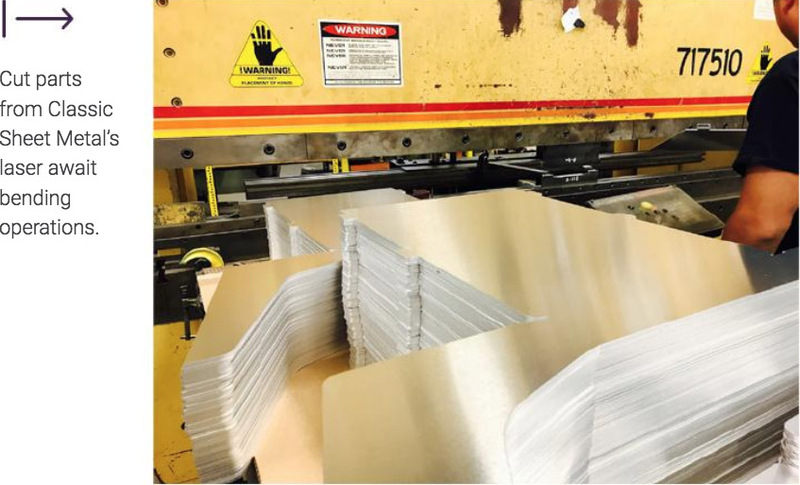 Jack Lococo, business development manager with Classic Sheet Metal, says that while the laser cutting process is the easiest step in the production of a Flipbin, cutting aluminum requires a specialized approach. After the metal forms are cut, they are taken to a Di-Acro press brake for bending. That step of the manufacturing process also required a specialized approach. Once the bends are completed, Lococo’s team also lays down 11 spot welds per unit, including on the kickstand on the back. Lococo says the work is actually quite similar to parts the company makes for its telecommunications and electronics customers, such as enclosures for radios and card cages for Internet towers. Flipbin storage units are also available without a coating, showcasing the natural beauty of aluminum. 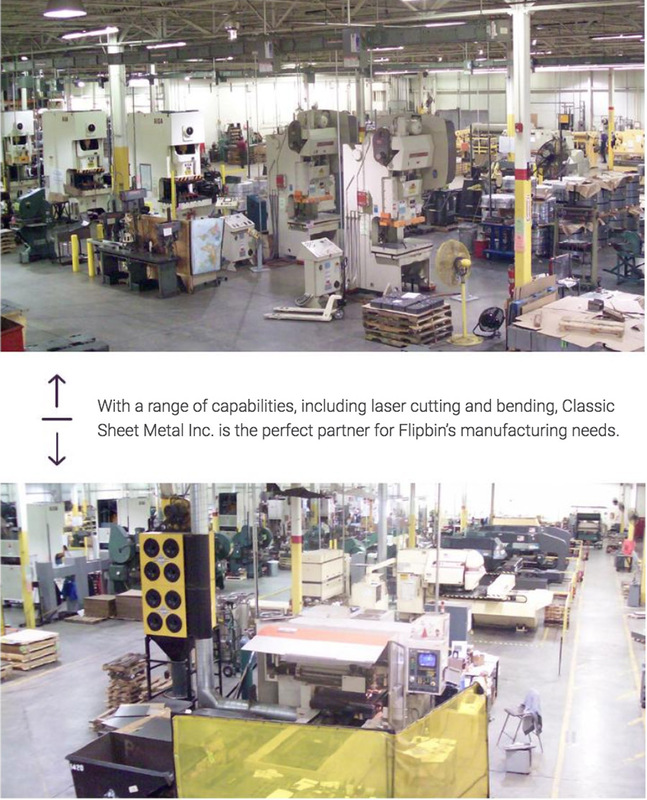 After Classic Sheet Metal completes the fabrication, the Flipbin units travel to S&B Finishing, also located in Chicago. S&B offers high-quality powder coating, liquid coating and multi-step coating services and is licensed to do a variety of work for companies such as Motorola, General Motor, John Deere and Caterpillar. The majority of the company’s work is with metal coating and metal paint finishing. 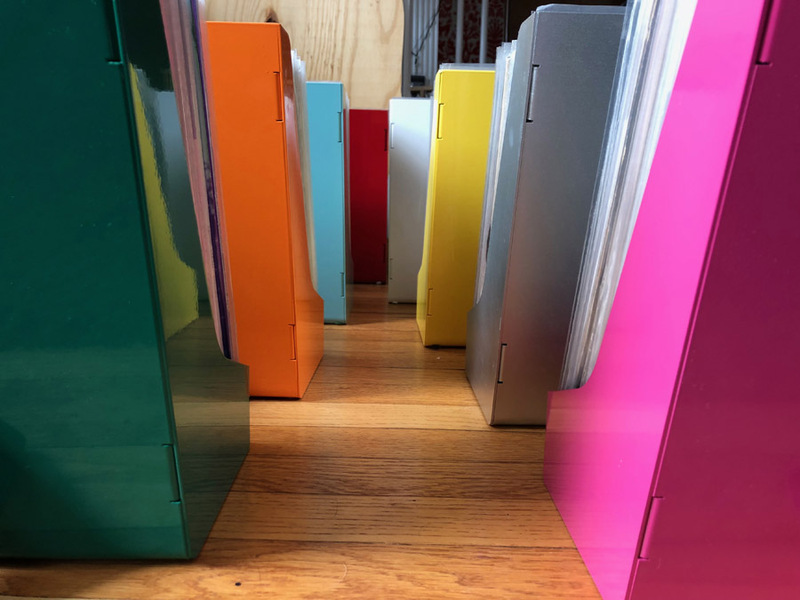 Kenny Spielman, owner of S&B, says with Flipbin being a local startup, he really wants to see them succeed – and he’s also a fan of the product. Flipbin’s units are powder coated in up to 11 different colors, from deep ocean blue green to bubblegum pink. The very first unit was powder coated orange, or tangerine, which has remained a popular choice. S&B primarily uses Nordson equipment, but also relies on Gemma and Wagner equipment to powder coat the units. Spielman and his crew have an automated system where they hang the units at the beginning of the powder coat line, which including curing, are ready for packaging at the end of the line about an hour later. To cure the powder, baking ovens are utilized for 10-min. treatments at 450 degrees. S&B also inspects the surface of the fabricated units when they come from Custom Sheet Metal to ensure there is no rust on the metal or that any sanded areas aren’t too deep. “We have color tips to make sure that what we gave Flipbin last week what matches what we give them this week,” Spielman says of his company’s quality assurance steps. Whether it’s Robertson’s Flipbin or a job for any other customer, the team at S&B prides itself on consistently high-quality work. Since the days when Robertson would browse through albums at his favorite record store wondering why there wasn’t a storage product for him to do that at home, times have certainly changed. 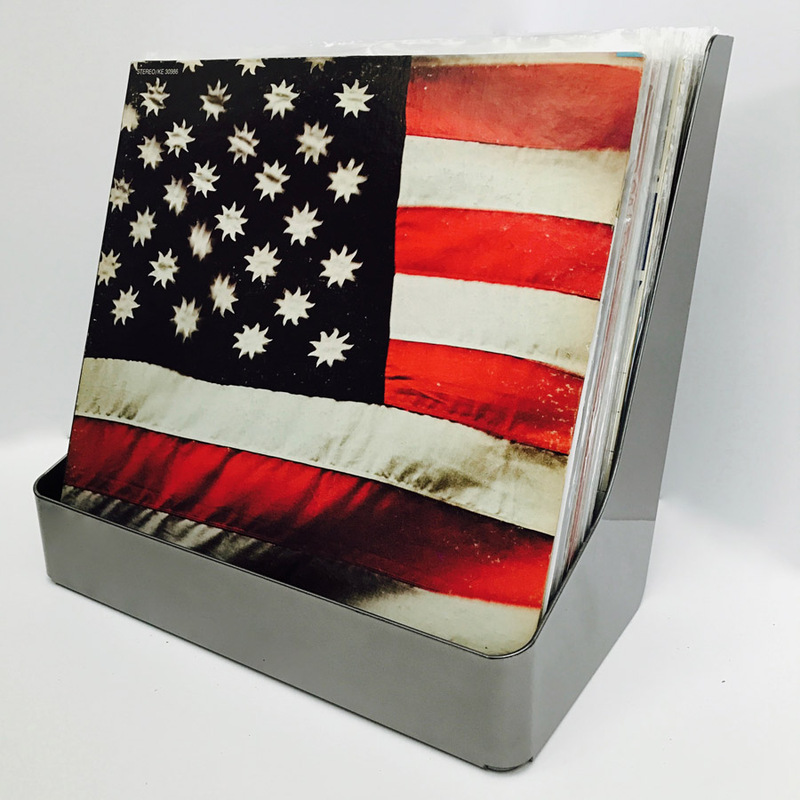 Today, Flipbin’s products are shipping to vinyl aficionados throughout the world. Made from aluminum, Flipbin storage units come in two sizes. Shown here are various colors in the standard 12-in. record size.